If you’re looking to impress your next Hearthstone opponent with class and style, add some golden cards to your collection! Golden cards are Hearthstone’s premiere collectable, thanks to their unique animations and gilded borders. Whether you unearth these rare golden cards from packs or craft your favorites with hard-earned Arcane Dust, these glittering cards are coveted and collected by many, each telling a unique story. The creation, conceptualization, and integration of golden cards came from a group of talented developers on the Hearthstone Team—Becca Abel, Kyle Harrison, and Jon Briggs. In today’s Hearthside Chat, we’ve gathered around the table with Jon Briggs to chat about how these beauties are brought to life. Heh, greetings! My name is Jon Briggs and I’ve been working on Hearthstone since 2011. I started out as the game’s first assistant project lead for its quality assurance team before taking on the initial prototyping and creation of the game’s golden cards. I was responsible for the animation of the majority of the golden cards for Goblins vs Gnomes. The creation of a golden card is a two-part process. First, I mask the art in Adobe Photoshop software and then create the supplemental visual effects on the card later. I use the masks I created to “assign” where an effect shows up on the golden card. This is the mask for Piloted Shredder. The blue indicates where the spinning blade of the shredder would spin, the gray circle is where the mechanical arm would shift up and down, the red denotes where I wanted the debris effect to be shooting off the blade, and the green is where I wanted the smoke and distortion to appear. Every golden card can have up to four layers. That means I can only apply and create up to four effects per card. Because of this, it’s critical to figure out how to get the most value from each layer in order to convey the overall vision for each card. 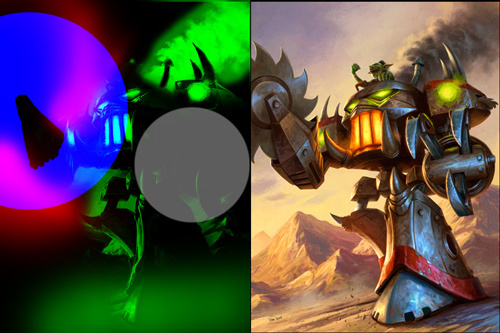 For example, Piloted Shredder’s smokestack effect doubled as the burning fire in the eyes and mouth of the shredder. When I work on golden animations for cards, I have to “paint out” aspects of the base art and animate it independently. The technology for animating certain aspects of the art has improved significantly since Hearthstone’s release. When we’re making animations for cards like Goblin Auto-Barber, we have to make sure it looks awesome and fun and works for all the platforms we support. We have to ensure you can have a board full of golden minions, a hand full of golden cards, two golden hero portraits and hero powers, and have everything still work great. There were over 120 cards in Goblins vs Gnomes, and that’s not counting “token” minions like Boom Bots. Every card and token minion in game required a golden version. Over the two months it took to create the golden cards for Goblins vs Gnomes, I averaged around 3-4 cards a day. The time it took to create each card depended on if the card was going to have an animated aspect to it. Before packing up and heading home each night, I got in the habit of choosing the 3-4 cards I’d tackle the next day. With some cards, I was unsure of what I would ultimately do to make them look suitably epic, so they would get passed over until only one card was left. For the record, the honor of “last golden card” for Goblins vs Gnomes went to Dunemaul Shaman. Ironically, he ended up turning out extra-awesome! The drenching storm pummeling him, the steam rising up from his body, and the water pooling at his feet really make for a cool animation. What Gets the 24 Karat Treatment? Deciding when to use animation for golden Goblins vs Gnomes cards was tricky. Ideally, we want to animate the card art in a way that adds to the visual experience, rather than become the focal point. Small animations like Flying Machine’s spinning turbine, Iron Juggernaut’s saw blade, and Antique Healbot’s swinging health potion help accomplish this. One of the biggest challenges we face when creating any golden card for Hearthstone is figuring out how to make a static piece of art look cool. If it doesn’t feature a flashy effect or some other attribute that can be brought to life, you have to make up interesting effects for it. King of Beasts is a great example of this. King of Beasts depicts a lion sitting calmly on the ground. How could I make a sitting lion interesting? I went in a more ambient direction with King of Beasts and added a pulsing glow from the torches behind him, a royal waving mane, and some ground dust and straw to finish the piece off. With golden cards, we always try to make sure that they tell a story. It can be as simple as visually tying the card’s functionality better to the art, or perhaps taking the base art and breathing life into what could be happening next, as if the art were alive. Fel Cannon is a good example of tying the functionality to the art. Fel Cannon’s motorized movement is identical to the Fel Cannon model in World of Warcraft. Maintaining consistency from World of Warcraft to Hearthstone added to the card’s overall feeling of authenticity. While it’s generally important to stick to the Warcraft lore when making golden cards, sometimes we have to make some alterations in order to create a solid looking effect. For instance, when players encounter Gahz’rilla in World of Warcraft, he has blue ice breath, but the blue didn’t read very well against the sky and the overall warm tones of the art. I decided instead to switch from the cool blue breath effect to a roaring orange fire breath effect and used the extra layers to kick up an awesome sandstorm around Gahz’rilla. Sometimes we just have fun with the card effects; Sneed’s Old Shredder being a good example of us adding extra Hearthstone flavor to a card. Game Director Eric Dodds and Production Director Jason Chayes wanted to add lasers to Sneed’s Old Shredder. Totally awesome. Who doesn’t want a shredder with eye lasers? It was especially fun to create golden versions of the cards that produce token minions when they’re summoned. Because Dr. Boom’s Boom Bot minions always enter play to the left and right of Dr. Boom, we wanted to ensure that some aspects of the golden cards tied them all together. 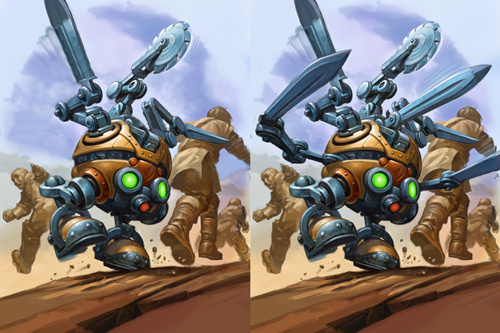 We added the same lightning in Dr. Boom’s golden version to the Boom Bots as well. Not everything worked when creating golden Goblins vs Gnomes cards. When creating golden effects, we had to be aware of the potential gameplay implications that could arise from our design choices. While it would make sense to have cool smoke effects on Rogue cards, too much animated smoke could easily be confused with the animated Stealth effect. The same applied to cards with the Enrage keyword. Red is commonly a color associated with rage, but too much red added to the golden version of a card with Enrage implied that it was enraged when it actually wasn’t! We could get a little carried away with certain effects at times. We were guilty of overdoing the drool on some cards, which we affectionately called “drool-tech” around the office. I also caught a little flak thanks to my fondness for leaves with the Classic set’s golden Rogue cards. Some effects are funny in concept, but don’t quite work out in practice. Noble Sacrifice once had the animated minion leaping from the left side of the minion portrait to the right in an attempt to make it look like it was jumping in front of the oncoming spell. Unfortunately, the minion just kept going out of frame forever, and left an empty minion portrait on the board. That was weird when the Noble Sacrifice’s minion survived the spell. Some animations seem cool on paper, but end up being way too fast and distracting when they were in play. For instance, at one time, Shadowboxer and Goblin Auto-Barber were moving about 400% faster than they are now! The mechs in Goblins vs Gnomes provided us with an abundance of opportunities to animate moving gears, saws, and other mechanized parts. We’ve come a long way with golden cards in Hearthstone, and we're continuing to improve on the technology as time goes on. Working on golden cards wouldn’t be possible without the incredible art created by the talented artists we feature in Hearthstone. I hope you’ve enjoyed this look into how golden cards are made and the design choices behind them, and I hope they’re just as fun to for you to collect as they were to make!